Who doesn’t love toe-tapping music? Especially if it is for kids? 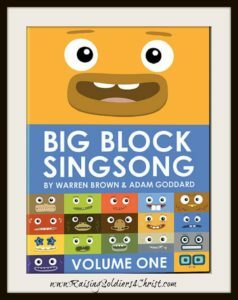 I was asked to review Big Block SingSong as part of Kaboom‘s advance launch party. I agreed although not sure what to expect. I’ve never taken the opportunity to watch these videos, but since Disney Junior put these out, I thought at least my youngest would especially enjoy them. Shortly after receiving the DVD, we had to take a 5 hour road trip to Tennessee. I grabbed the DVD to allow my 3 boys to watch and give me their thoughts on it. The DVD is wonderful!!! My youngest watched it no less than 10 times on the trip alone. He hasn’t stopped watching either. He says this is his new favorite movie! He’s only 5 years old, but he also has the attention span of a 5-year-old. For him to sit and watch this movie over and again is a remarkable feat in itself. For those who follow my blog regularly you know I am extremely picky about what my kids watch, read, and listen to. 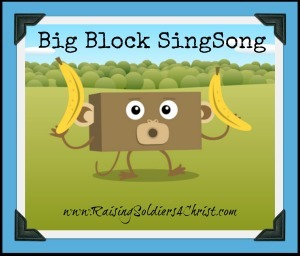 Although I seldom promote videos that are not Christian, Big Block SingSong has nothing in it that is inappropriate. It has the cutest characters that keep children entertained, it is educational and the songs are wonderful and easy for kids to learn. The songs teach about animals, body parts, and much more! My little man can sing almost all of them without the video….lol! This DVD is approximately 48 minutes long and contains 24 episodes of Big Block SingSong. The episodes come from the very popular segments off Disney Junior. Moms and Dads you will find yourself singing and tapping along with the music as well! My mom came along on our road trip and sat beside my youngest. She also enjoyed the DVD as much as my youngest (she should because she watched it each time my youngest watched it…haha!). I want to add that the animation for the video is amazing! The animation is often times important, especially for kids. It is sure to keep children entertained throughout the duration of the show! Here is your chance to enter to win yourself a copy! Wouldn’t this make a great gift for your kiddo? Thank you to Kaboom Entertainment for my advanced copy and for this giveaway!